The Cuyahoga Community College Foundation Presidential Scholarship Luncheon is a premier event with a long tradition of raising critically needed scholarship funds for Tri-C students, helping them access education as they pursue the American Dream. Since its inception in 1992, the luncheon has secured nearly $20 million, with proceeds benefiting scholarships that assist students with financial need in pursuit of education. A capacity crowd of over 1,000 community members attends the luncheon annually to hear a dynamic keynote speaker. 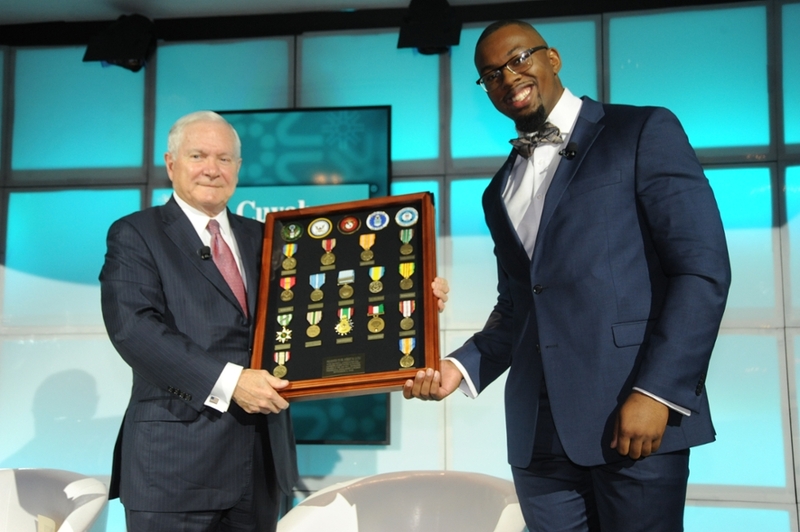 In 2018, former secretary of defense and New York Times best-selling author Robert M. Gates entertained and enlightened luncheon attendees. Having served under eight U.S. Presidents and as president of Texas A&M University, he brought a unique perspective to the podium. Dr. Toby Cosgrove, executive advisor and former CEO and president of the Cleveland Clinic, moderated the session. Thank you to all of our generous donors who supported our 2018 Presidential Scholarship Luncheon. The 2019 Presidential Scholarship Luncheon Speaker has yet to be announced.